Exterior images by Scot Facer Proctor. All interior images (and one night image) used by permission of Intellectual Reserve. 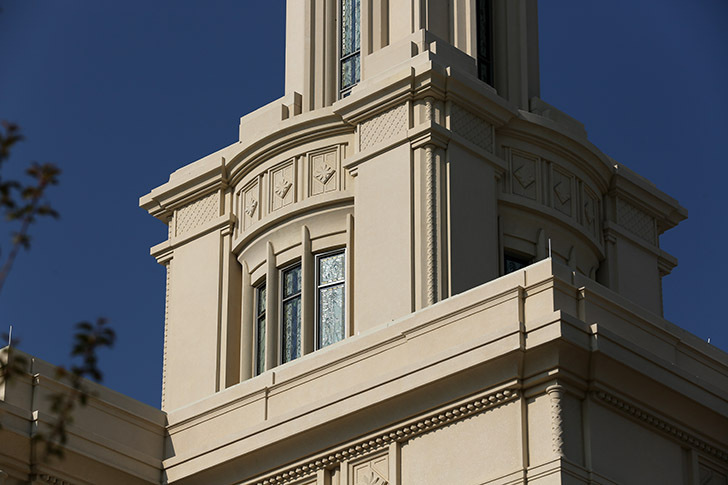 Just when we thought we had seen the most beautiful temple ever…we were invited to tour the soon-to-be-dedicated Payson Utah Temple. It is magnificent beyond words. It is, as if, the experience and lessons of 180 years of building temples is paying off as never before. How did a little orchard and farming community (population 19,154) get such a temple? 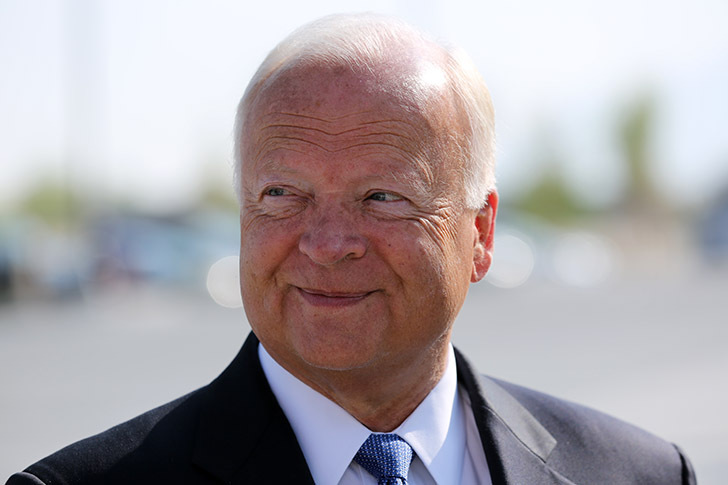 Elder Kent F. Richards, Executive Director in the Temple Department of the Church said that the growth of the Church along the Wasatch Front warranted the building of this temple. 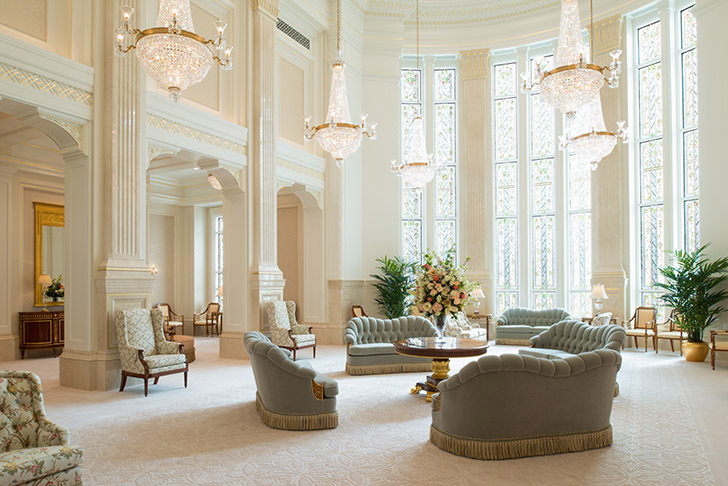 In addition, Elder William R. Walker, former Executive Director in the Temple Department, told us that President Monson told the department to look at building a temple there–a prophet’s wish and a prophetic view. Come with us for a few minutes on the press open house and see some of the exterior and the interior of this stunning edifice. It will lift your day (just don’t show these images to your eligible daughters or you’ll be planning a wedding in Payson Utah). 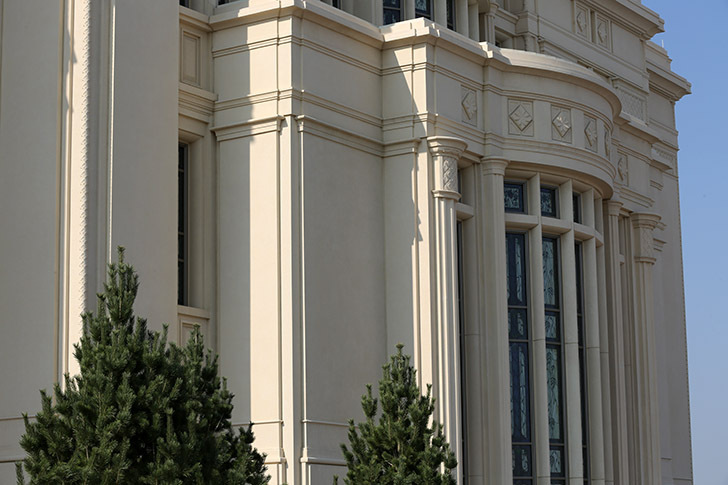 The Payson Utah Temple (hereinafter Payson Temple) will become the 146th operating temple of The Church. 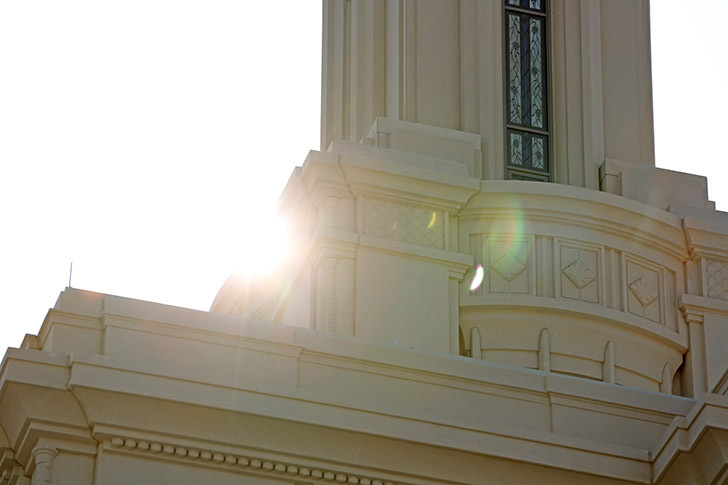 The temple will serve about 93,000 members of the Church living in 27 stakes from Mapleton to Delta, Utah. 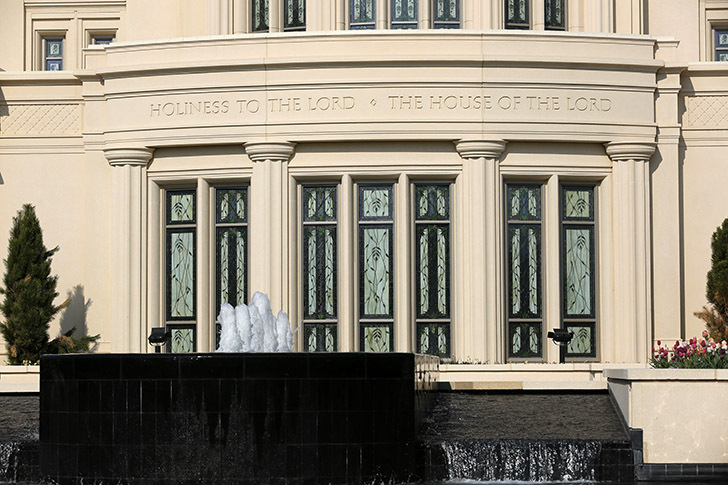 Etched above the entrances on the east and the west are the words: Holiness to the Lord – The House of the Lord. Under the direction of the Lord Himself, the work of building temples is proceeding at a fast pace throughout the world. When all the temples are completed that have been announced to date, there will be 173. 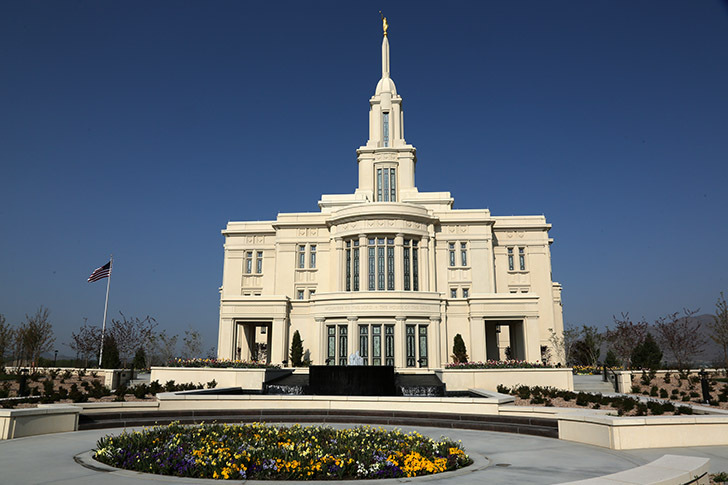 The Payson Temple comprises 96,630 square feet on interior space and sits on a lovely 10.63 acre site. The numerous art glass windows let light stream into the temple from all four sides. The intricately done art glass windows were created by Tom Holdman and his team who have done many of the temples of the Church. The Payson Temple is the largest temple to be built in the past 19 years and will become the 15th largest temple in the Church. In the fall of 1850, Brigham Young advised that a settlement be made on the banks of Peteetneet Creek in this area. He selected three families consisting of James Pace, John Courtland Searle and Andrew Jackson Stewart to go to the area. It took the party approximately a week to travel the 60 miles from Salt Lake to Peteetneet Creek, where they established a settlement. It was later named Payson in honor of James Pace and his sons. 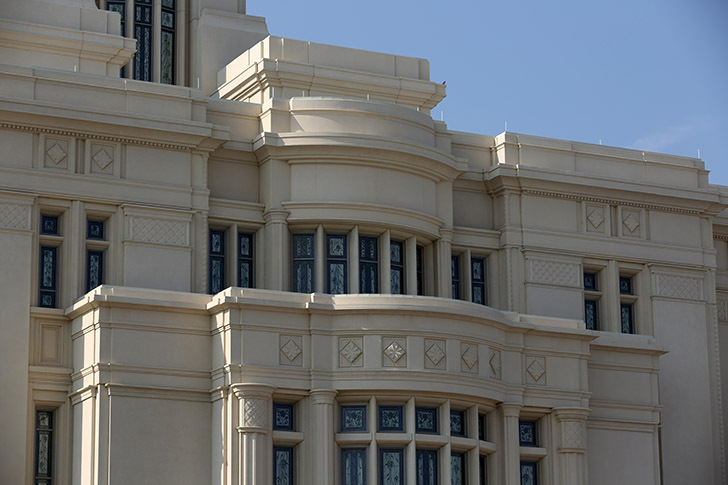 The local architect of the Payson Temple was Architectual Nexus and the contractor was the Wadman Corporation. Elder Richards told us that many of the hundreds of contractors who worked on building this temple considered this the highlight work experience of their lives. 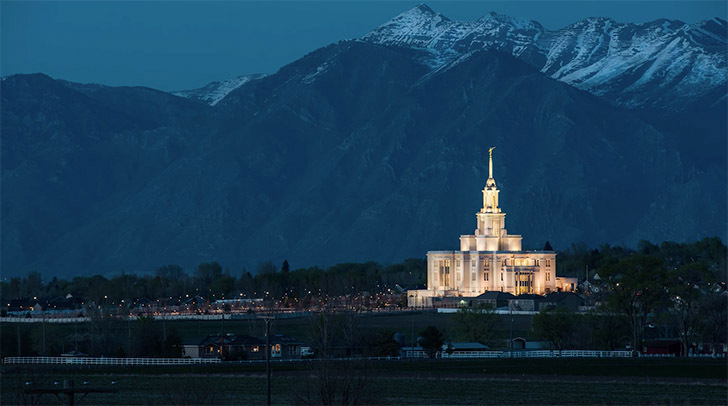 The temple stands on a gentle rise of a hill only a few hundred yards from Interstate 15 and had already become a beacon to the south end of the Utah Valley. On this day when these 14 press outlets (including Meridian Magazine) toured the temple it seemed like the sun was shining especially bright to show off the beauty of this temple. Just this past week the workers, contractors and builders and their families, numbering 8,000, toured the temple to see the work they had just completed. There were many tears of joy. 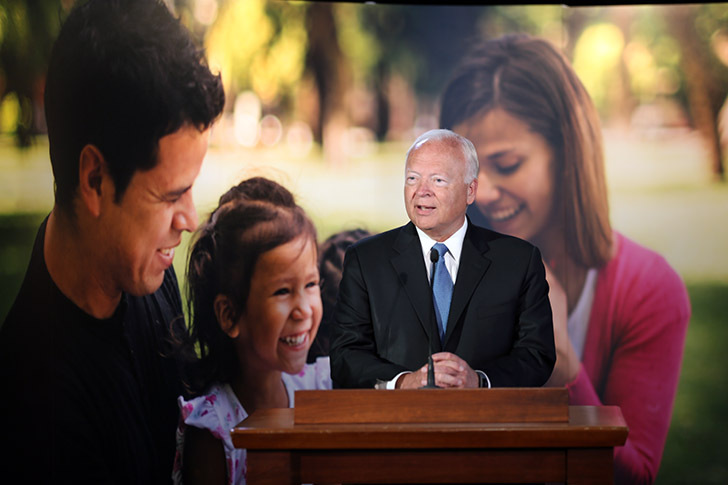 Backed by a large image of a beautiful family, Elder Kent Richards addressed members of the press and prepared them to take a thorough tour of the new temple. 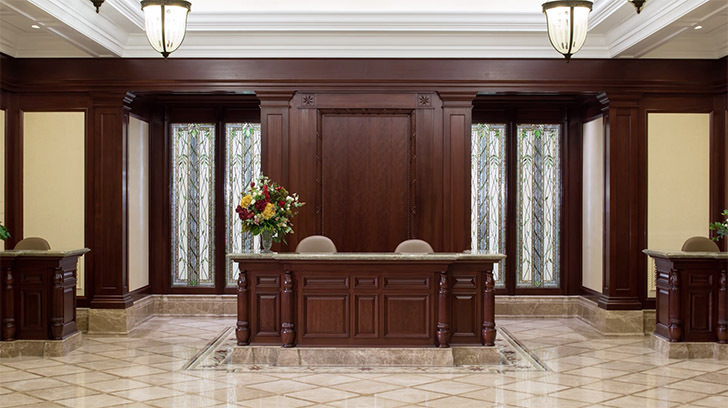 The interior of the temple is trimmed with magnificent sapele mahogany wood throughout. It doesn’t matter whether a patron enters the temple from the east or the west. 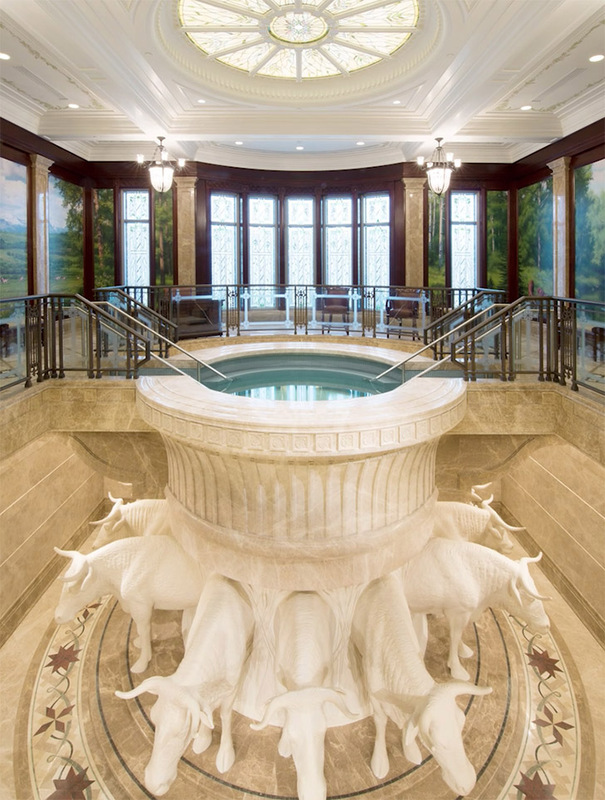 The beautiful baptistry is a place where thousands of youth from the Payson Temple district will come and perform vicarious work for the dead who did not have the opportunity in this life to have that ordinance. As in all other temples, the font is placed on the backs of twelve strong oxen, with three each facing east, west, north and south respectively. The motif throughout the Payson temple is centered on the apple and the apple blossom because of the many orchards in and around this community. The subtle greens in the carpets and the reds and greens in the furnishings are simply stunning. 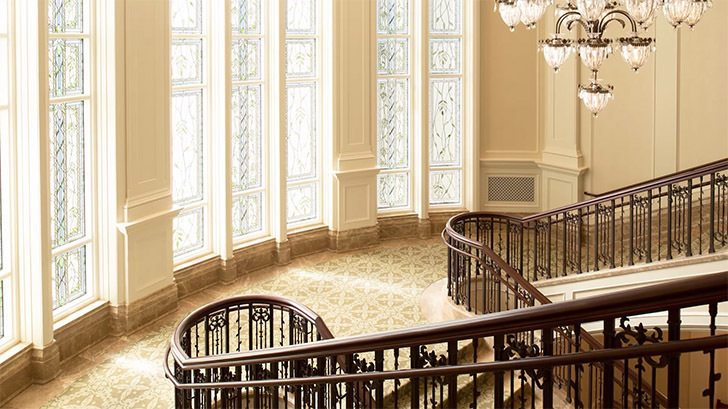 Patrons ascending the beautiful stairways are bathed in light from the numerous outside windows, carefully built of art glass. There are also 19 original art pieces hanging in various parts of the temple. All of the artwork either shows the beauty of nature, captures some history of the local area or centers in Jesus Christ. From the baptistry to the sealing rooms, patrons will ascend in symbol of drawing closer and closer to the presence of God in the celestial world. There are three large ordinance (endowment) rooms and seven sealing rooms in this temple. Patrons will not progress from room to room as in some temples but will receive their main instruction in one room. The celestial room could not have done more to bespeak its name. On the media tour there was no talking when we arrived in this room and some of the press had tears in their eyes as they admired the beauty of this room and felt a special spirit here. 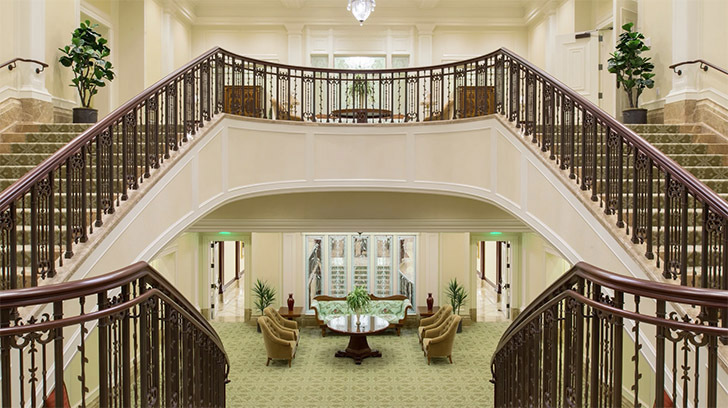 Beautiful, old-fashioned circular couches greet patrons entering from either side of the room. Marble and other stone work came from Portugal, Spain, Turkey and other parts of the world. 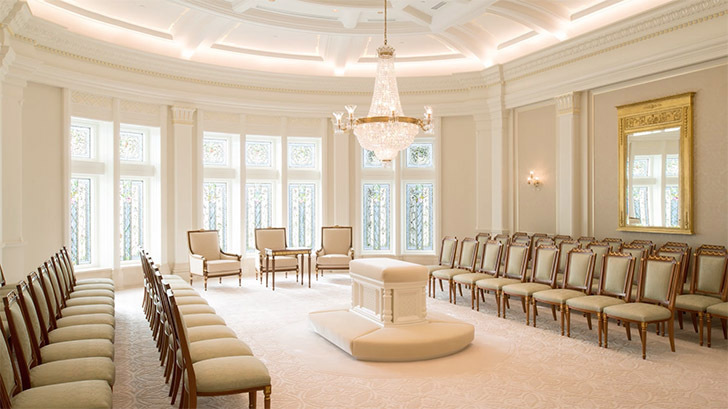 Three of the seven sealing rooms in the Payson Temple will accommodate at least 70 guests. 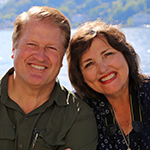 Here couples and families are sealed together by the authority of the priesthood for time and for all eternity. 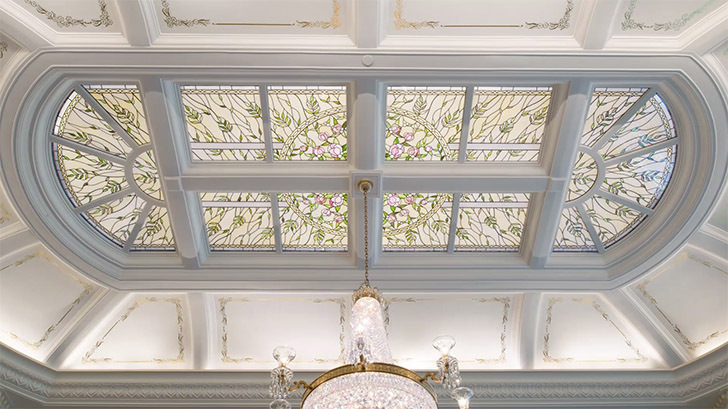 Even the ceilings in these magnificent rooms draw the patrons eyes upward and fill the room with light. 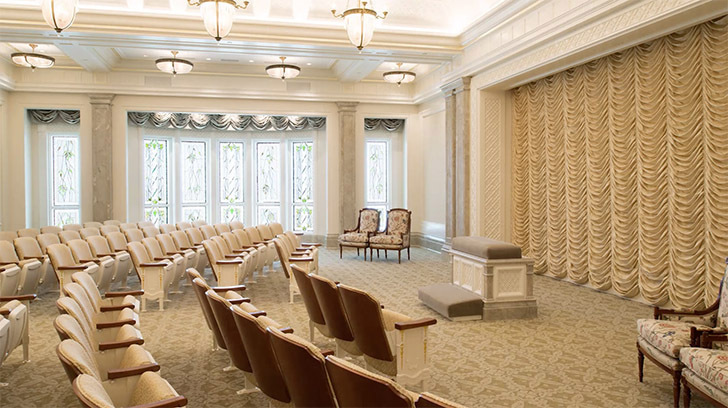 Nearly 100 weddings have been scheduled for the first month of operation for the Payson Temple. 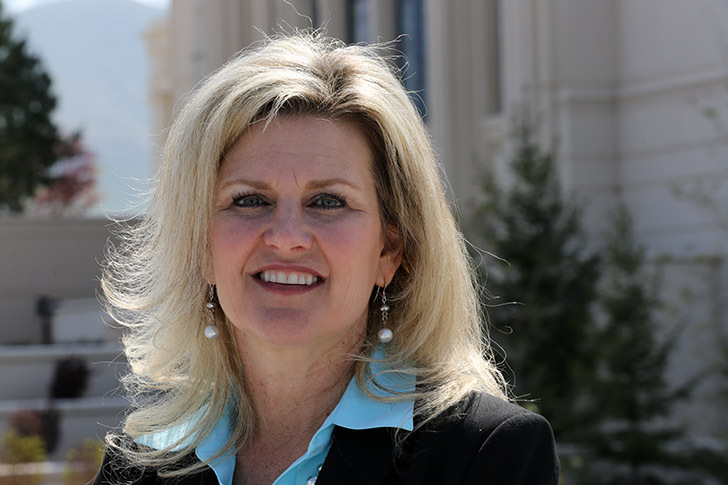 Sister Lana Hiskey, Public Affairs Chairperson for the Payson Temple District was most excited about the youth celebration that will be held on June 6, 2015, the day before the Payson Utah Temple will be dedicated. She said, “We have more than 100% of our youth participating in the celebration.” “How is that—more than 100%?” we asked. She said that the youth are asking their friends of other faiths to join them to dance and sing in the celebration of the temple with the theme: Fill the World with Love. 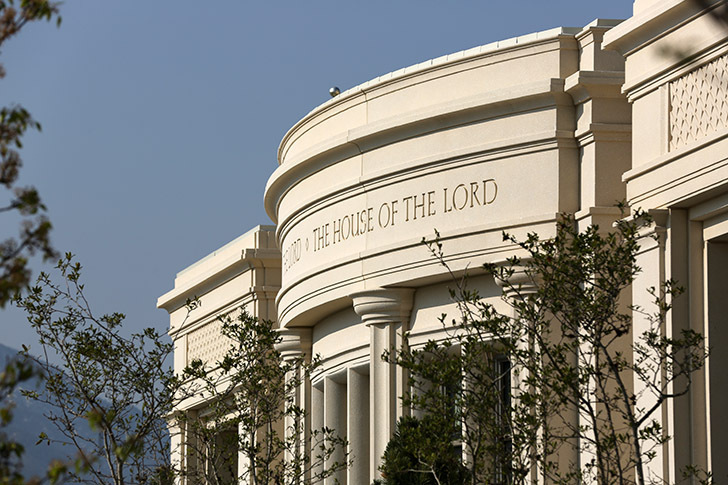 The First Presidency of the Church has announced that the open house will begin on Friday, 24 April 2015, and will continue through Saturday 23 May 2015, excluding Sundays. Tours are available on Monday from 8 a.m. until 5 p.m. and Tuesday through Saturday from 8 a.m. until 8 p.m. The temple is located in southwestern Payson, 1494 South 930 West, and can be easily accessed within a mile from the 800 South exit of I-15. 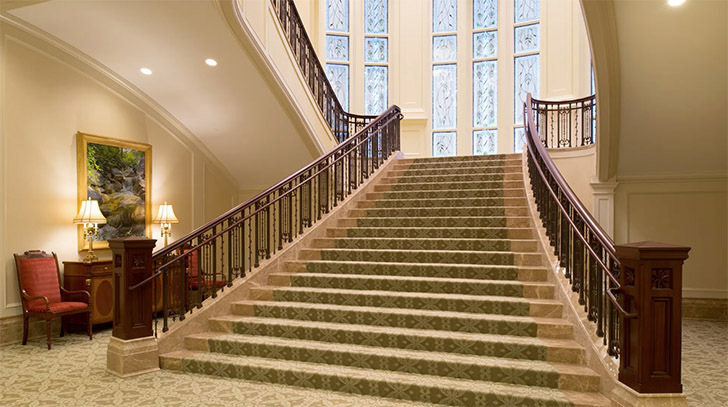 Open house tickets are required and can be obtained free of charge by logging on to https://templeopenhouse.lds.org/ or by calling 1-800-537-6214. If you are anywhere in the area, don’t miss it.